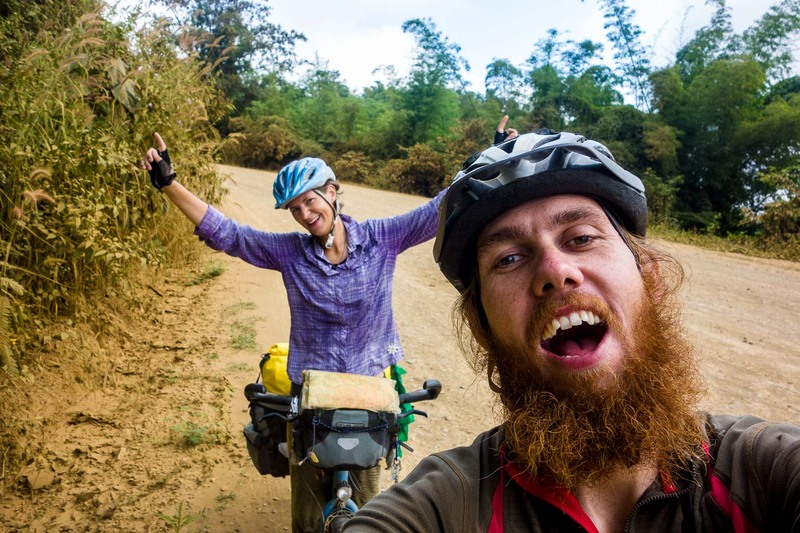 Home/China, North west China, Off the beaten path, Winter cycling/We cycled to China, everything changed! Cycling is what we have been doing the last 11months, we are now used to the process and it has become a comfort zone of ours to cycle. We spent almost 4 months in the ‘Stans’ where change came in small bits. 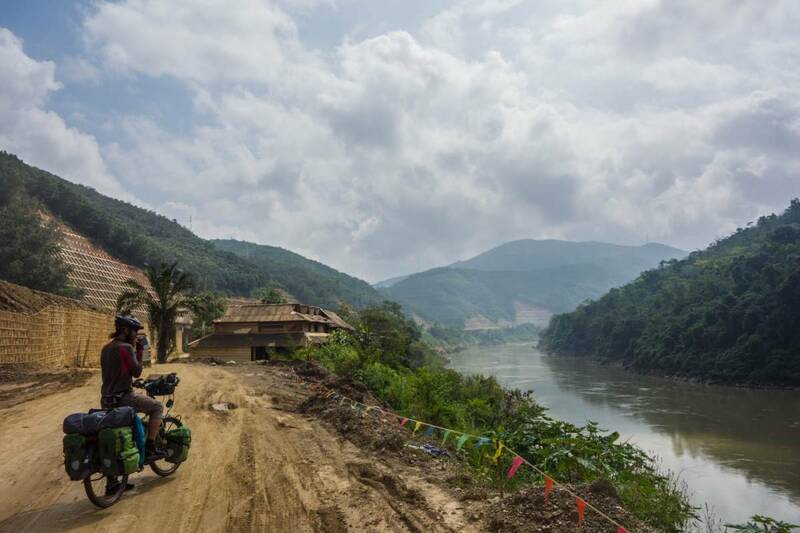 Now we have cycled to China and we have a hard time believing that we really cycled all the way to China. We had reached the Kazakhstan border post which was hectic but not unpleasant, actually most borders we have crossed until now have been quite okay, somehow there are many blog posts about border issues in these regions on the Internet to be found. We had read several blogs on the subject and were always a bit nervous before the border controls. Which we can now look back and tell you that please don’t worry if you have plans of coming in this direction by bicycle. We were stamped out of Kazakhstan and had to cycle some 7,5km of no mans land. Again no attention had been made to clear the road from snow and ice, so our studded tires did their job. Arriving at the Chinese border post was overwhelming, organized, modern. No real issues on entering, just overactive photographing of us and before we new it we were standing with our bicycles in China! What a feeling. We cycled into the Chinese city of Khorgas, bought a SIM card at China mobile paid 10$ and signed several pieces of paper. It was now lunch time so we asked if there was a restaurant near by and we were glad to hear that there was one just up the street. The north western part of China has many ethnic people and a mayor group is the Uighur. The language of the Uighur is related to Kazakh/Uzbek so we were glad to see that our first visit to a restaurant in China was an Uighur one where we could order Laghman and naan. The taste was great and we were full ready to venture in to the unknown and big China. First night in China we wild camped even though we were close to a town where there would be a hotel, but we needed our comfort and quietness of camping. Found an okay spot to set up the tent in a vineyard. Another icy night as the tent was filled with ice from the moist in the air, this we are getting used to although ice down your back when putting your clothes on in the ice cold morning is less nice! While packing up the tent we got a visitor a local sheep herder with his herd of sheep. We packed up and got on the road, still we could not believe we were in China and we were cycling here in the winter… We stayed on a secondary road most of the day which slowed us down a bit because of snow, ice and slush but we got to enjoy some small villages and get in to the feeling of western China. Exploring China, stopping for drinks and snacks when possible, we knew that the pass was coming. We had no other choice than to push up the pass, there it was: a valley on the other side of the road with 4 houses! That’s our spot we knew it but how to get there? Fences and barb wire on both sides… We had now learned that every few kilometer there was a u-turn opening between the roads. We cycled 100m and we were lucky an opening, we crossed the highway and drove down to our spot. Pushing the bikes up the valley to the houses was tough as the snow was deep and hard. The houses were herders houses but they had left for the winter, so no hospitality this night we thought. Martin looked around found an open room a storage room not perfect but possible, it was dark now and getting really cold. We looked at the locked doors and thought would they mind us sleeping in there? We un screwed a lock and found a small room with a stove and a place to put our tent. A warm night and the next morning we left some money for the things (mainly cole) we had used and cleaned up after us. Jinghe a city where we would spend a day, the road was now very uneventful as we were just on the highway. Jinge proved to be a good place to stop, finding a hotel was not as easy. A local lady helped us to find a hotel that would accept us after the first three turned us down (probably because of no foreigners) Joanna thanks ;). We rested and enjoyed food very very much! Time went fast and we had to get on the road and reach Urumqi. We left Jinghe and as most times after comfort and a shower we have to get into the road life. Susanne had a tough day and that reflected on both of us. Martin was keen to push and Susanne was less in a mood. We somehow got into a discussion and Martin wanted to push on so ended up demanding Susanne to empty her panniers from food so she would be lighter. This was an ignition to a discussion about further cycling. It was hard but Susanne could feel that she did not need to cycle in the cold for much more. 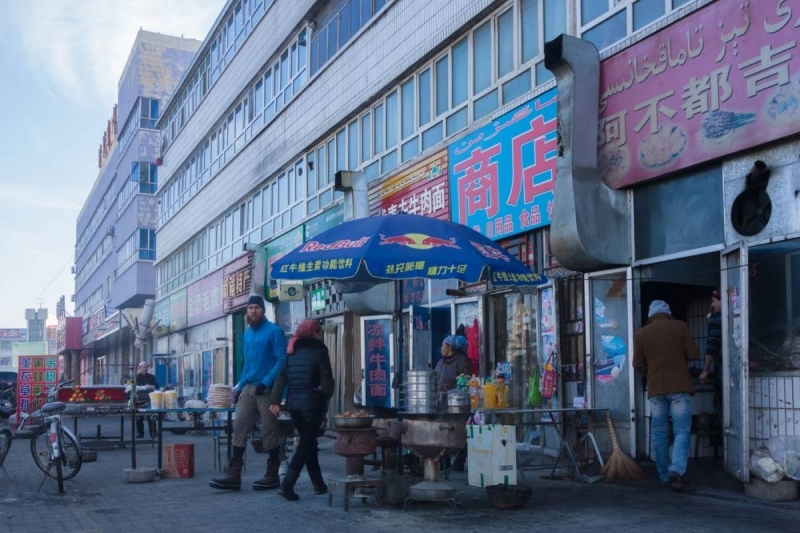 Urumqi would be the stop and place to think. That night we camped next to the highway we remained calm and went to sleep with many thoughts in our minds, by the way this was Christmas Eve.. Packing and leaving a hotel is always a lot of work as we have 6 bags each, we managed fast and were on the road at 8.30 we had 200km to Urumqi and slowly we could see that we would be able to do this in two days. We stayed on the secondary road s115 and G312 and cycled 108 km! One more night in a truckers hotel we payed 10$ and there was a restaurant guess what we had…. Laghman! Urumqi a city of 3million people we were lucky to cycle in on a small road and the Garmin GPS helped us again to navigate to our Hostel. We made it to Urumqi what a great feeling! Here we stay for New Years and to plan the progress of our travels. Merry Christmas and a Happy New Year! 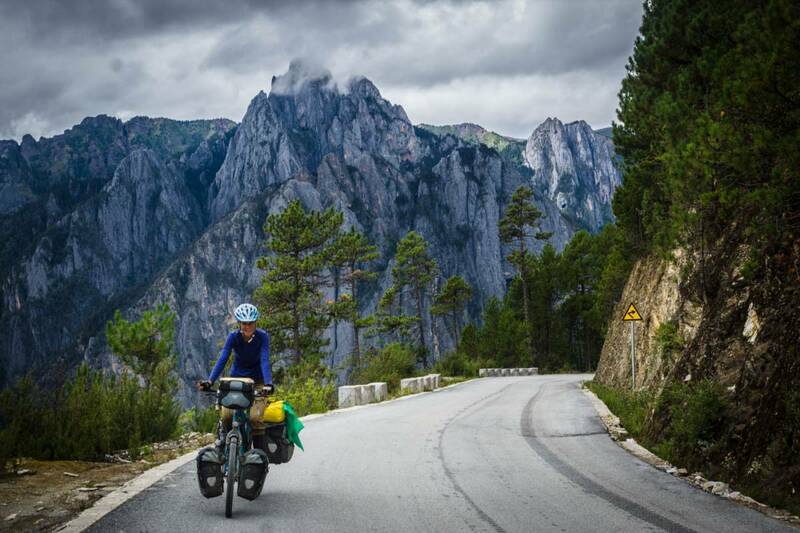 Below you find our detailed cycling route from Khorgas to Urumqi.